Schools in East Africa.” Kevin and Marna gave a presentation on the New York Quarterly Meeting’s African Education Committee’s work at the Kisangura Friends Schools in Mugumu, Tanzania. The NY Quakers pay the annual school fees for approximately 125 primary and secondary school students who have been lost one or both parents to AIDS. They also work to improve the schools through building projects. Both of the Kisangura schools have no running water on campus. A current project is working with the school communities to repair their cisterns and build bio-sand filters which would purify water they collect. 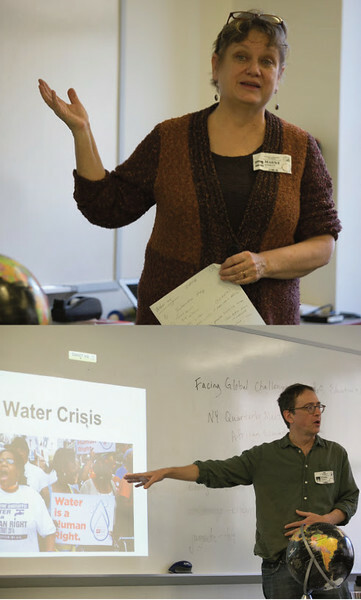 The NY Quakers are partnering with Friendly Water for the World, a Quaker organization from the Northwest, on the bio-sand filter project. Kevin and Marna have made several trips to the Kisangura schools; this summer Kevin traveled there with another BFS teacher, Ellen Kahan. For more information on the program, please e-mail Marna.